Selected by Founder, Chairman and CEO to head Marketing team of 15 corporate & field marketing professionals. Oversaw consumer communication, branding, consumer research, and public relations. Directed ad agency, PR consultant, and internal resources in execution of marketing plan. 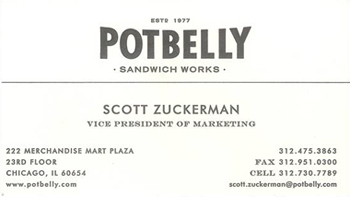 Grew Potbelly sales by over 40% during tenure.